This time of year is always stressful. I don't care who you are. It's true. But these past few weeks have been nothing short of an emotional roller coaster. 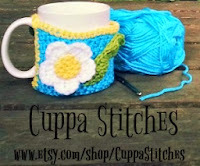 I've talked about my Etsy shop before (Cuppa Stitches, in case you didn't know ;-) ). I was hoping for some sales in my shop this holiday season. I've come a long way since I first opened but I know that my shop is small potatoes compared to so many others out there. Etsy has forums for sellers and buyers. I keep reading about this so called "Christmas rush". No way my little shop will get hit with a rush, but a few sales would be nice. The summer was a bit dry as far as sales, but things were starting to pick back up. And then Black Friday came, followed by Cyber Monday (Week? I really don't know what to think of or call these shopping days anymore!). I've lost track of how many bearded beanie hats I've made in the past two weeks. I know that number is in the double digits. If you want me to go in and count, it might send me into panic mode. I have more than one open order which has never happened since these past two weeks and I'm freaking out a bit. I'm right on track for making and shipping things out on time but knowing what I need to make and how many things is another story. If I don't make my list of what to make and by when, I start panicking, just like some do on that first drop of the roller coaster. I ended last year with 7 total sales in my shop and as of yesterday, I hit the ever impressive 100. At least to me. I'm so proud of how far I've come and all I've done, but I can't celebrate until the last open order I have is complete. Or at least down to one. A few other things have happened lately that have only added to that emotional roller coaster, but you'll have to wait until another day for me to share. I promise I'll share before week's end. I flew off the handle and only just calmed back down. If I bring those emotions back to the surface, I'll never get these orders done correctly.